It’s a question I often hear when people hop in my car for a ride. 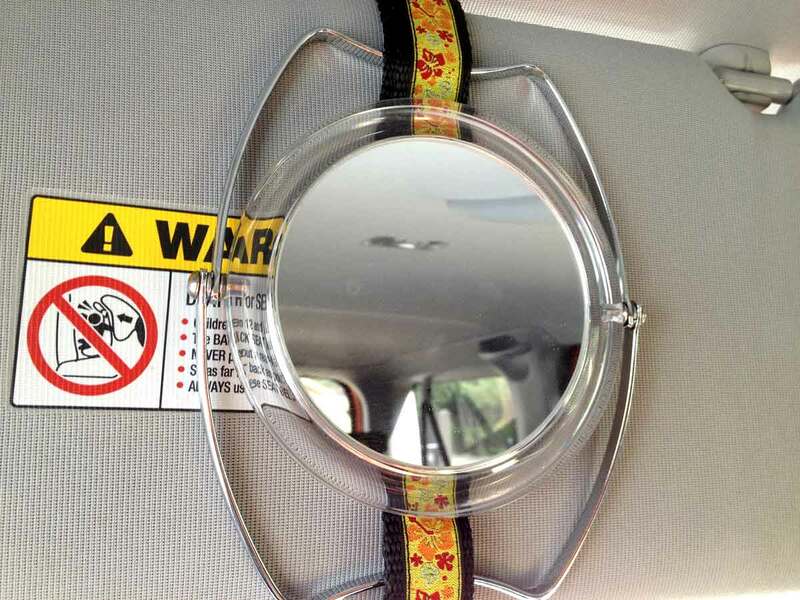 I flip my visor down to block the hot Texas sun and then you see it – my two-sided round mirror attached to my visor with a dog collar – a very pretty dog collar. The setup clearly exposes my design philosophy, first find a way to make things function (or in this case dual function), then make it pretty. Thinking outside the box helps. It’s really just as simple as that. You see my Honda Element came with a mirror on the passenger visor, but not the driver visor. I thought about it and decided if I bought a nice cosmetic mirror and could find a way to attach it to the visor, it would be especially nice as I could then also remove it for use if needed. Think “gee I forgot to pack a mirror in my suitcase…oh yeah there is the one on the visor” kind of thing. Then the second part came to me; just use a nice dog collar to attach it. I mean, they have those great snaps, which make it very easy to quickly remove the mirror, and hey, you never know when you might find a stray dog that needs your help. It works, and I keep a couple of extra leashes in my car too. You never know when they might come in handy! 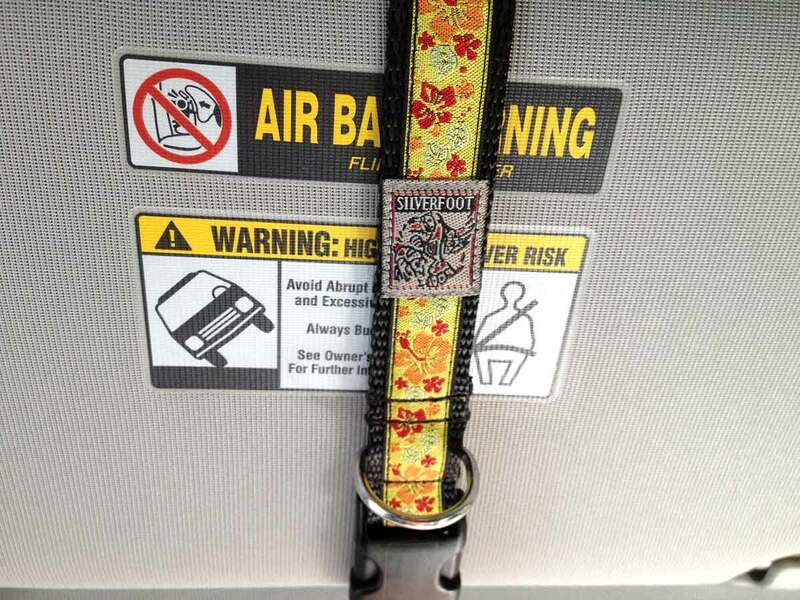 This entry was posted in Pets, Wordless Wednesday and tagged Automobile, Car, Dog, dog collar, Mirror, Wordless Wednesday. Bookmark the permalink. That’s clever. I keep a spare leash but not a collar in the car for strays. I’ve been thinking about getting a slip lead though. Yes, a slip lead would be great! I realize an actual collar would certainly not fit every dog, although they do have some play in them as far as sizing goes. I usually keep a few dry treats in the car too. I have found lost neighborhood dogs in the past and gotten them back to their owners…much to their relief. Coincidence? First, I find it silly that a car company would not think to offer a mirror for the driver side. Guess they only want passengers to look pretty! But then, it occurred to me how mysteriously someone (not naming names, dadd–) broke the driver side mirror so it doesn’t close and the light stays on. So when there’s sunlight, you can’t drive without looking at yourself. Perhaps they should have added a pocket lid instead (like the old cars) so then this problem would never have happenend. But I digress… Just last evening my Momma (the clever one) decided if she put double sided velcro, the thing would open and close at will. Presto! it works. So your story about the mirror – makes sense. However, I still think a car company who does not think to put mirrors in BOTH visors is not very driver-friendly. WOOF! Your Momma did good! And yes, both visors should always have mirrors, I definitely agree. Fortunately the Honda Element has a lot of headroom, so I don’t see myself in the mirror as I’m driving down the road (which is a probably a good thing!). That’s a pretty cool idea 🙂 I bet those people never would have known it was a dog collar! I used to always have leashes in my car too. They were clinic leashes that I borrowed. And thank you for your nice comment on my blog earlier! Thanks Ann. Some folks realize that it’s a dog collar, and those are the ones that are so surprised. But it really does work well. I bet she will think of something! Can’t wait to see how it turns out! !